Reason for Reading: Buddy Read with Heather. On Discworld, a dying wizard tries to pass on his powers to an eighth son of an eighth son, who is just at that moment being born. The fact that the son is actually a daughter is discovered just a little too late. The town witch insists on turning the baby into a perfectly normal witch, thus mending the magical damage of the wizard's mistake. But now the young girl will be forced to penetrate the inner sanctum of the Unseen University--and attempt to save the world with one well-placed kick in some enchanted shins! 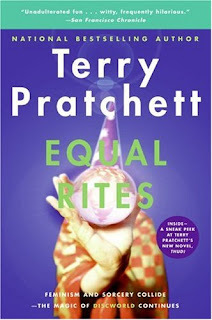 This is the second part of our review of Equal Rites by Terry Pratchett. You can read the first part of it on Heather's blog, Tales of a Capricious Reader. Enjoy! Heather: My favorite so far is Nation. It was the first one I read and the one that made me fall in love with Pratchett’s writing. Being the first, it introduced me to the... uniqueness of the Pratchett world and I just loved, loved, loved the two main characters. Equal Rites probably falls in behind the Tiffany Aching books, which are all pretty much equal in my eyes. Nation is like Pratchett dialed up to 11, with Tiffany Aching being around an 8. I can totally see where the similarities between Tiffany Aching and Equal Rites could affect your enjoyment of the book. I think I’m still so new to Pratchett, and new to my completely adoration of him, that it didn’t bother me quite as much. It just felt like more fun in Discworld to me. I have Wyrd Sisters on hold with the library for my Nook; I hope I can start it soon! Incidentally, The Amazing Maurice and his Educated Rodents is probably a 9.5. How about you? What is your favorite Pratchett? Kelly: Good Omens is my favourite. It was my first read by him and I loved it. It was so weird, it was brilliant. It is actually one of my favourite books of all time. It was my introduction to both Pratchett and Gaiman, so I think that is part of its appeal. I just don’t think that I have presently read a book by Pratchett that compares. I always really enjoy his stories and the world he has created, but I always am left wanting more. I have read a few random books in the Discworld series, but that was a while ago. More recently I have read the same books as you. Nation was what lead me back to reading more Pratchett and it was really good. The Amazing Maurice was a lot of fun and the Tifanny Aching series a really good young adult series. He has written a very empowering female lead and the books should be read by a wider audience! I loved the random Discworld books that I read and they were later books in the series, so I know that I have lots of good things to look forward to in the future. Heather: I need to read Good Omens. I should adore it, since I love both Pratchett and Gaiman! So far, all the female characters I’ve encountered in Discworld have been strong, empowering women - another reason I adore Pratchett. I wish I knew how to convince more people to give him a read. I think they hear “fantasy” and it scares them off, which is such a shame. They really should give him, and a lot of fantasy, a try. I think they would be pleasantly surprised. Kelly: I know. Fantasy seems to one of those scary genres that people group together and just refuse to read any of it. It’s rather sad! I confess to not loving some genres, but I still have been known to try a few here and there if the book sounds interesting. I don’t like to limit myself because then you might miss out on something great. An example, the Gardella Vampire Chronicles by Colleen Gleason. They are placed in the romance section, so I was a bit wary at first, but they turned out to be a great series. Pratchett wrote books that should appeal to all ages if people can look beyond the fantasy label. Heather: I agree about the Gardellas. And of course, about Pratchett. He is definitely one I want to convince everyone and their mother’s sisters cousin to read. He’s just so bloody brilliant and funny and and and oh, just amazing. Which Pratchett are you going to read next? Are you going to continue on to Wyrd Sisters or try something new? I was thinking of reading Good Omens, the one he wrote with Neil Gaiman. That book has AWESOME written all over it! Kelly: Good Omens remains my favourite by both authors. I haven’t read anything yet by either that I enjoyed more! It was my first by both of them, so I am picky. You are in for a treat! It was such a great book. One of these days I must reread it... Currently I am planning to go with Wyrd Sisters, but that can change with my mood. I have a few other options and then there are always rereads. Is there anything else you want to say about the book? Heather: Can’t think of anything! We have to do this again soon! Kelly: I know! It was a lot of fun! All you do is keep reminding me that I need to read something by this author. I would be hard pressed to pick just one favourite from Pratchett. Some are definitely better than others, but overall the series as a whole is great. **Care: It will be a great thing, though! **Marg: I haven't read enough of them yet to look at them overall. Soon, though! Loved Equal Rites! Granny Weatherwax cracked me up. 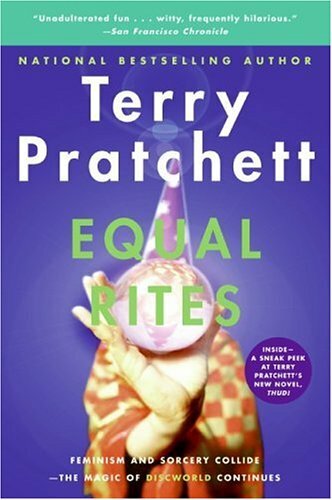 Must be an enjoyable read Equal Rites: A Discworld Novel by Terry Pratchett. loved the way you wrote it. I find your review very genuine and orignal, this book is going in by "to read" list.